This unique Centennial moment comes from the pen of Dad Frank Arthur Marshall who wrote to Lancaster Chapter in Lancaster, Pennsylvania, for their Annual Banquet program booklet in 1929. Because of its length it is presented in two parts. I have been often asked, “How did you happen to write the DeMolay ritual?” The bare facts can be briefly stated. I wrote it because Frank S. Land asked me to do so, and because Almighty God whom I have thanked in my heart a thousand times, gave me the impulse to respond to the opportunity which the request involved. Soon after I first became acquainted with Brother Land he gave up his private business to become Secretary of the Scottish Rite Employment and Relief Association. Of his activities in that capacity I heard comparatively little though our personal relations became closer through Association in the official line of the DeMolai Council of Knights of Kadosh in the Scottish Rite Bodies of the Valley of Kansas City. Let me say parenthetically that many years before I became a Freemason Jacque DeMolay was one of my heroes. Forty years ago and more I wrote a little private “creed” in which I gave DeMolay a high place as an exemplar of loyalty to conscience. When, therefore, I became a member of DeMolai Council (it will be noted in passing that the name of the Consistory body is spelled with an “I” instead of “y”.) DeMolay appealed especially to my imagination. As a member of the line while Brother Land was Commander, I became more and more closely drawn to DeMolay, perhaps unconsciously preparing for the work that was to come. Early in the summer of 1919 Brother Land invited me to write a ritual for the club of boys whom he had drawn about him in the course of his work, which frequently brought him into contact with homes where the need of an uplifting influence was sharply defined. He explained in a general way, as well as in some detail, just what he had in mind and impressed upon me the dramatic instinct of the boy nature which craved expression through a ritual. As I have previously suggested I have thanked God a thousand times that Brother Land should have honored me with the invitation, but especially that he put it in my heart to feel the need and to meet it to the best of my ability. In a way, I was the logical selection for such a task from Brother Land’s standpoint, for I was one of a few newspaper men in the Scottish Rite Bodies, though by no means the only writer. However, whatever the fitness of the situation, I was invited, accepted and wrote a ritual which none of us ever dreamed would be one of the rallying points for an army of hundreds of American boys and lads in other lands. I have had many sweet moments in my life but one of the greatest joys I have ever experienced was vouchsafed me when I read my first draft of the Opening and Closing and the Initiatory and DeMolay degrees to Brother Land. The very spot where I read it has a sanctity for me. Brother Land sat at the secretary's desk in the auditorium of the Scottish Rite Temple at 15th and Troost Avenue in Kansas City and I sat on the step. It seemed to me that I could see the great vision which was to become a reality, forming in Brother Land’s mind as I unfolded the ritual to him as far as it had progressed. His remarkable genius for executive detail later enabled him to develop the floor work and those splendid boys who exemplified the ritual breathed into it the breath of life which made my first witnessing of the degree work another of the fine landmarks in my life. The auditorium of the Scottish Rite in Kansas City will always be a shrine to me. It was here I took the vows of the Rite and at its altar I received a ring presented to me by the boys of the Mother Chapter and which is one of my most treasured possessions. At that altar I saw for the first time splendid young fellow take the vows of DeMolay and the Ritual was unfolded in a manner which was a projection of the future growth of which none of us really dreamed at first. Perhaps my greatest difficulty at first was to avoid Masonic phraseology, for in the pioneer days the fear of copying Masonry was very great and there was a very definite opposition to anything that suggested any connection with Masonry, or that DeMolay should appear as a preparation for future Masons. 1.) The spelling of “DeMolai” became “DeMolay” early in the life of Mother Chapter. Why do you think it changed? 2.) Dad Marshall’s writing style is different from the way people write today. Do you think it is representative of his era, or is it over the top, even for that time? Why? 3.) 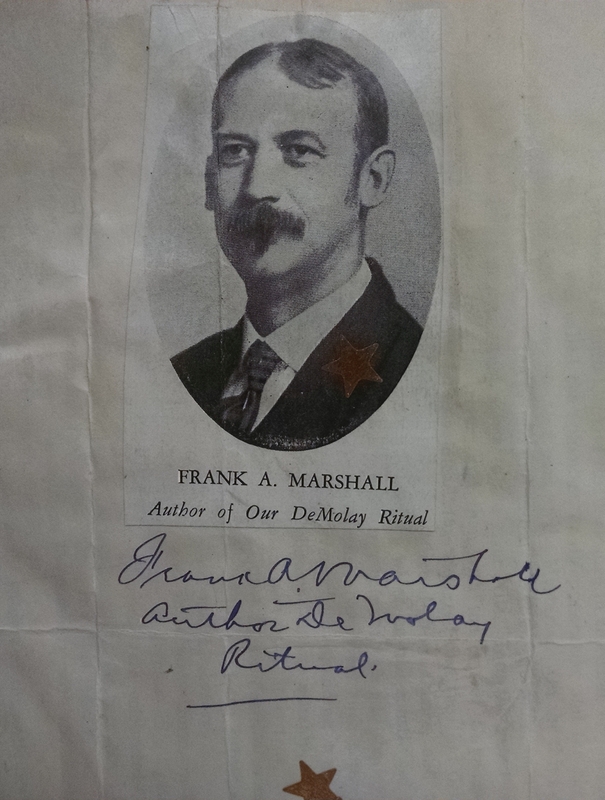 Dad Marshall called the Scottish Rite auditorium “a shrine.” Do you think he was being dramatic, or does this seem like a genuine feeling? 4.) Do you have any special places in your life that give you a special feeling when you return to them, or even think about them?